I started with Reverse osmosis deionized water and made water corrections. 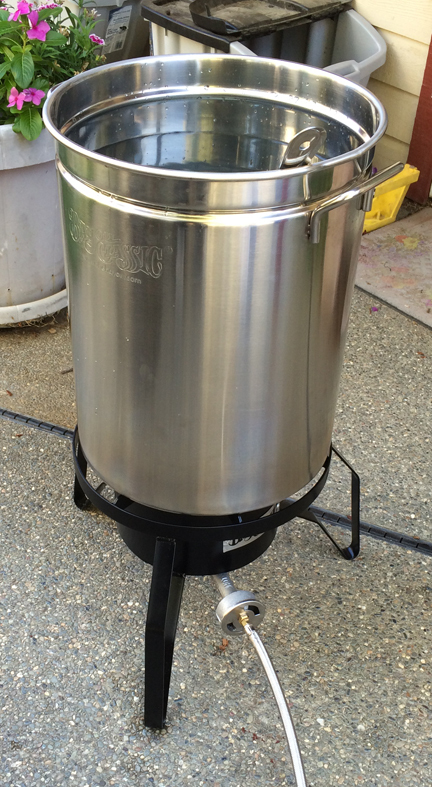 I have a 44 quart Bayou Classicstainless brew pot. If I were to do it over, I would have ordered a 66 quart minimum. I think between 60 and 80 quart would be optimal for this style of brewing. The 44 quart pot was a bit cramped. I got the Bayou Classic SP10 propane burner. It puts out a lot of heat. That is good. The heat control at the low end was a little more difficult. I wish the control valve was a bit better quality. But the entire burner and regulator was only $54. 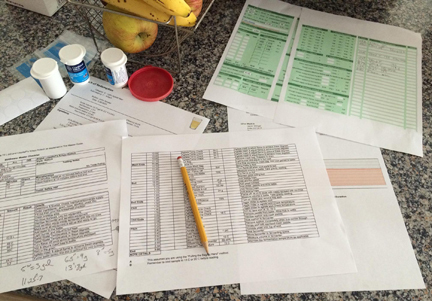 I had prepared for brew day by getting my grain bill, hops, water amendments and preparing my checklist, all using BIABacus. The reason you need a big pot is that EVERYTHING goes in it. 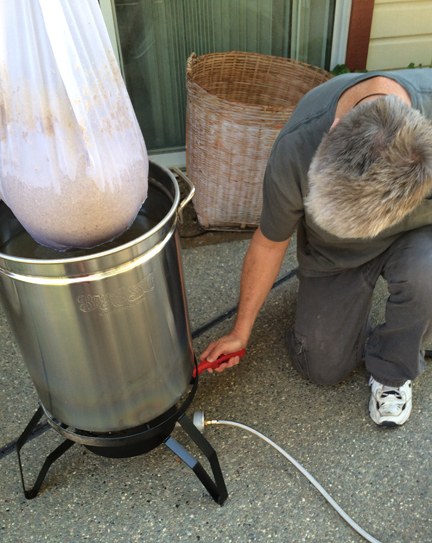 Your Mash water and sparge water are combined into one water. 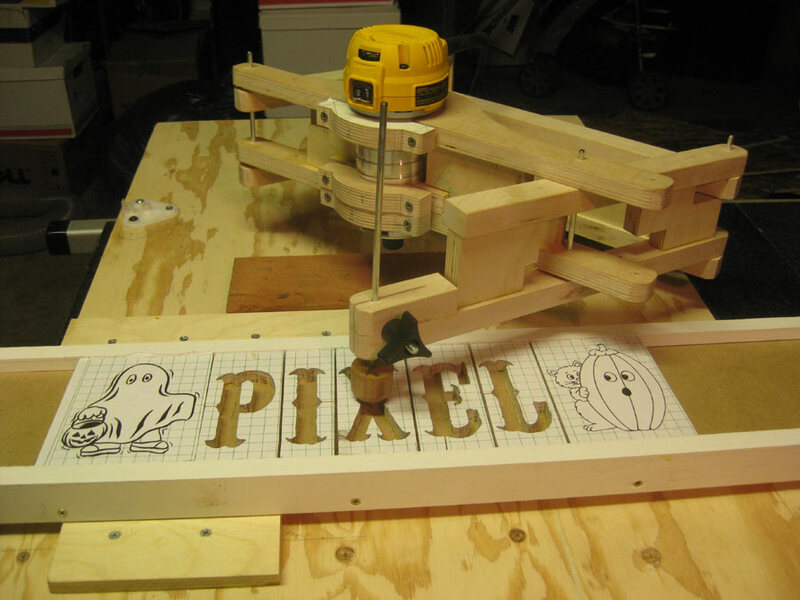 You calculate the strike temperature and then add the grain. 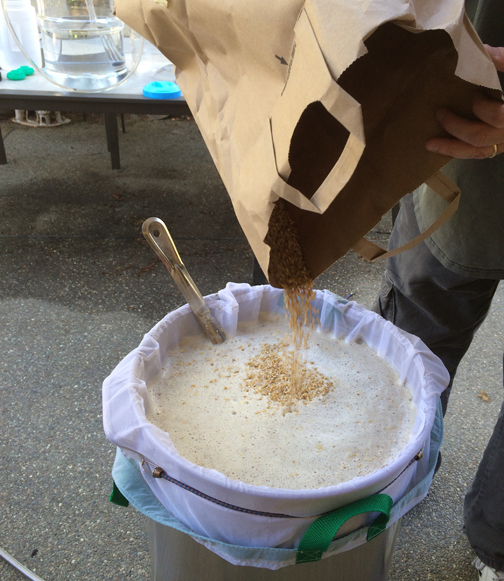 You end up with a big batch including all water, grain, your brew bag, spoon, etc. Then once the mash is done, you begin removing things. You get a fair bit of space back. But it is nice to have more space to begin with. 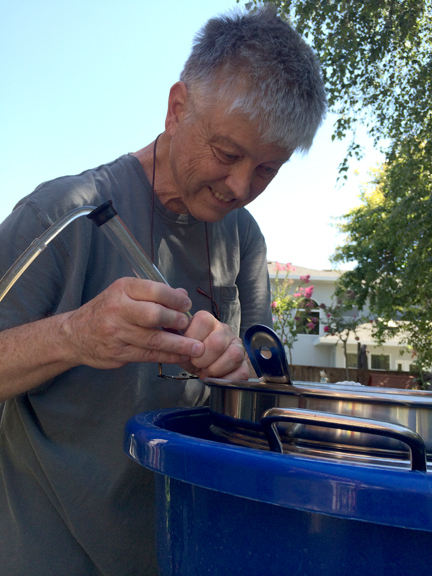 Your water loss will be mainly dependent on the diameter of the kettle. 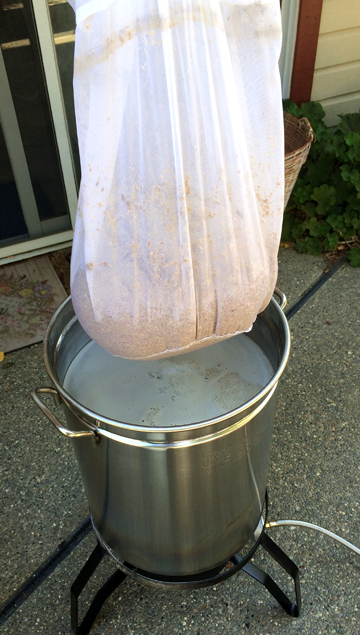 Here I have attached the brewing bag, heated the water, and am raining in the grain. It is rained in slowly so as not to clump. Stirring after multiple smaller additions. 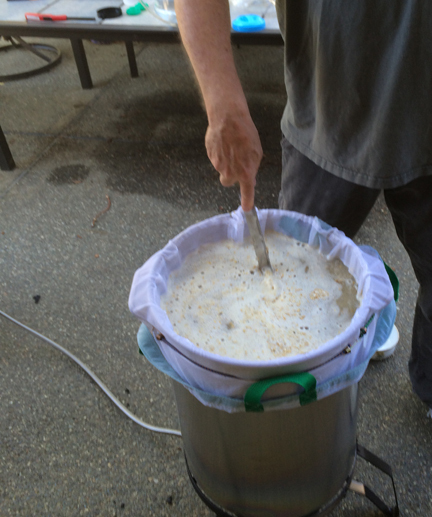 Then a temp check and mash is underway. 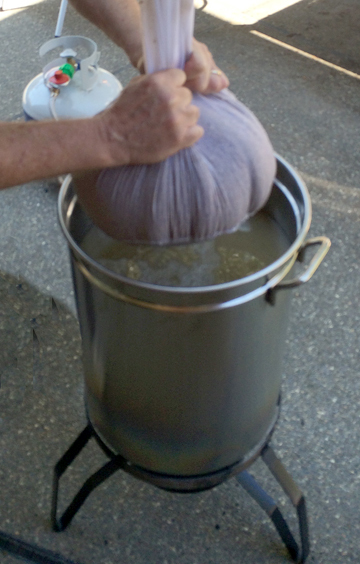 After the 90 minute mash, the bag is lifted so it can drain the sweet liquor into the brew kettle. 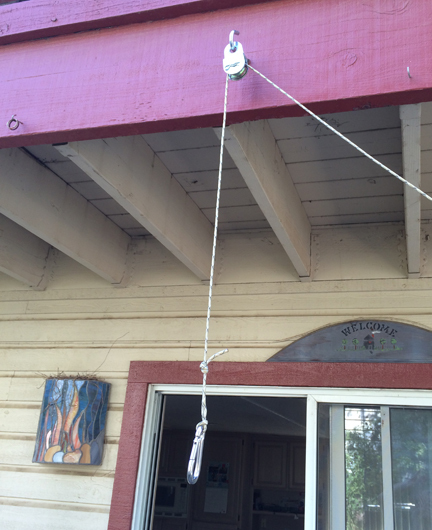 A sky hook and a pully makes lifting the warm heavy bag much easier. I incorporated lifting loops into the bag I sewed. See bag construction post. The bag is raised slowly and the lift line tied to a clete. 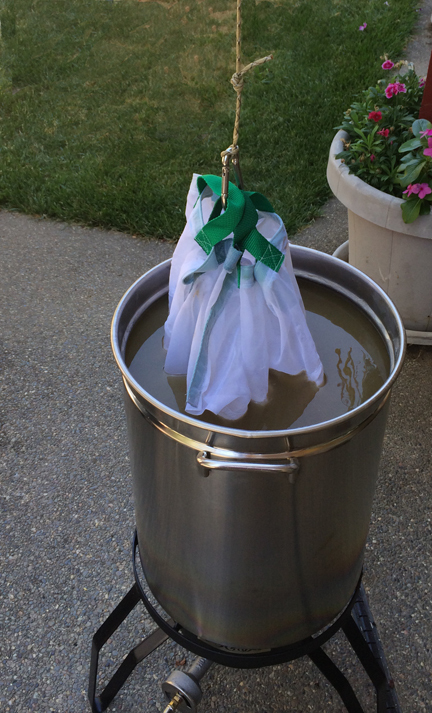 For a 5 gallon batch, lifting by hand is not really a problem, but it is nice to suspend the bag for a while so it can drain completely. After the 90 minute mash, the bag has been lifted. 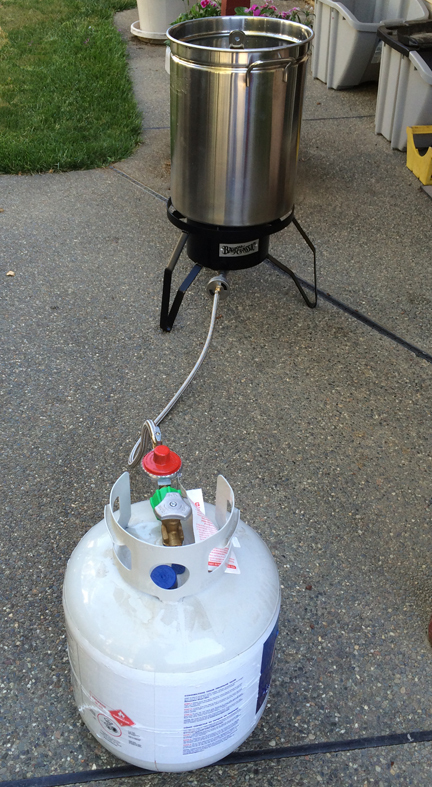 The flame is reignited so the liquid is coming to a boil while the bag drains. A quick bag squeeze, and then remove it. Stir frequently to prevent boil-over and caramelization or burning on the bottom of the kettle. Pay no attention to my cool purple pager. Add the hops at the correct time. Then get the chiller ready to put in at 15 minutes. 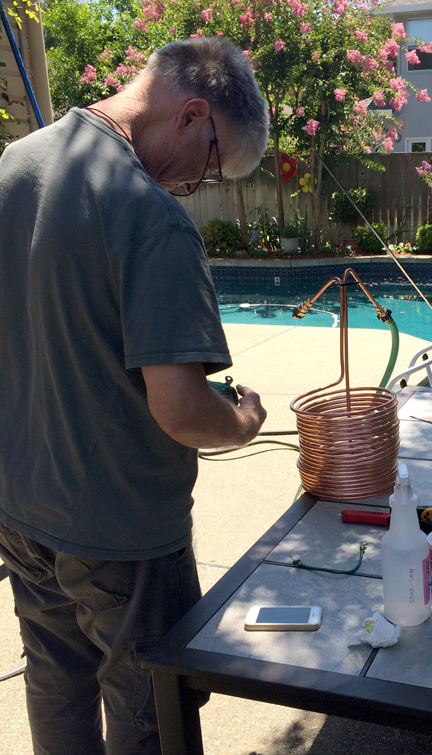 I can use pool water to chill and return the water to the pool. 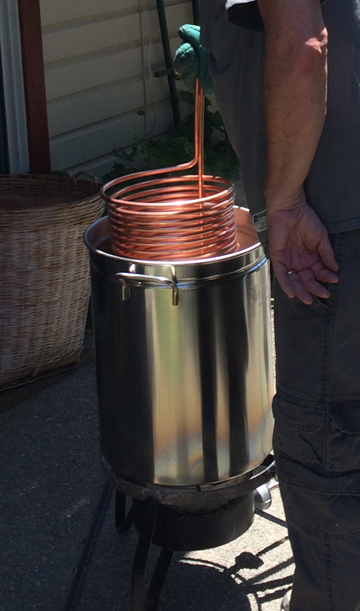 The Chiller, paddle and lid go in / on to sterilize. Whirfloc added at 10 minutes. 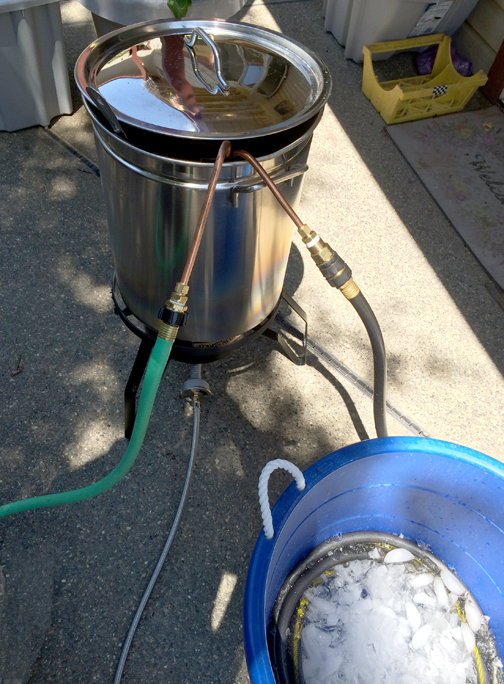 Carefully lower the chiller into the boiling wort in the kettle. Be careful not to be in front of the openings as scalding steam and water may escape. 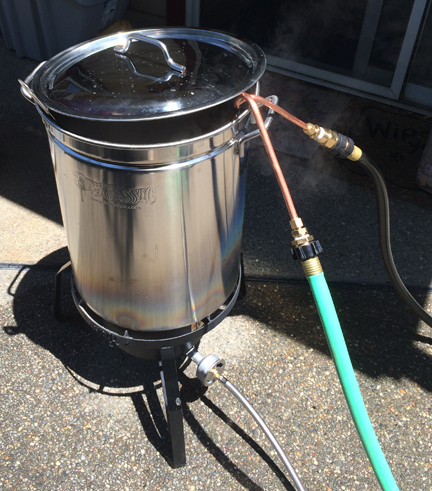 See my wort chiller post for details on this device. The quick disconnect on the inlet is indespensible. No need to wind the hose into the fitting. It makes for a fast connect to the hot pipe as well. 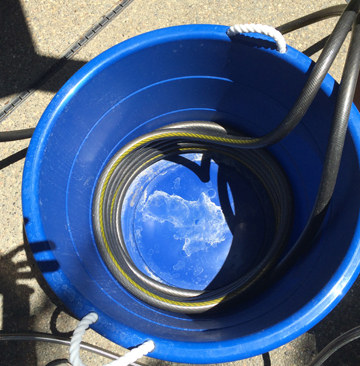 I filled a plastic tub with coils of hose and covered them with ice. This helped chill faster after the kettle was down to about 100 deg. F. My pool water is at 85. 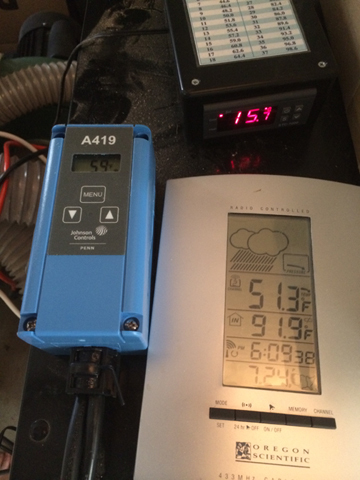 I chilled the wort to 59 degrees. 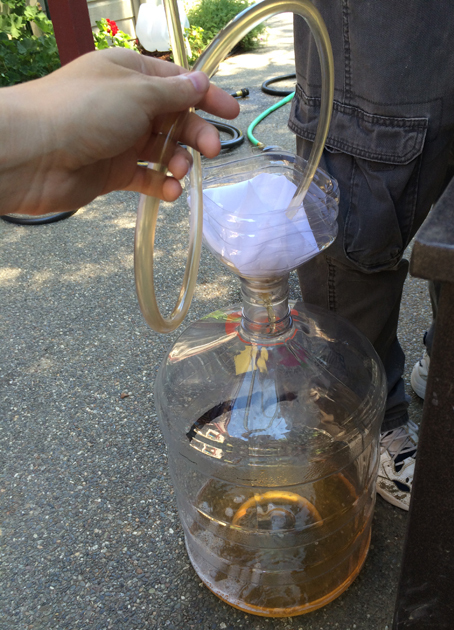 Then I siphoned to a 6 gallon Better Bottle to ferment. A little more than 5 gallons go into the primary. I will rack to a secondary to eliminate any trub and excess yeast. 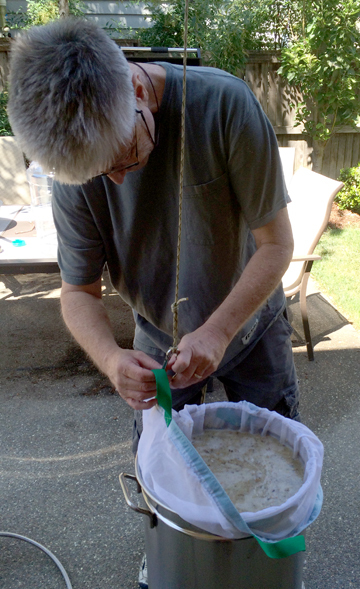 Filtering through a sanitized voile cloth. This didn’t work so well. The cloth eventually clogged and had to be removed. 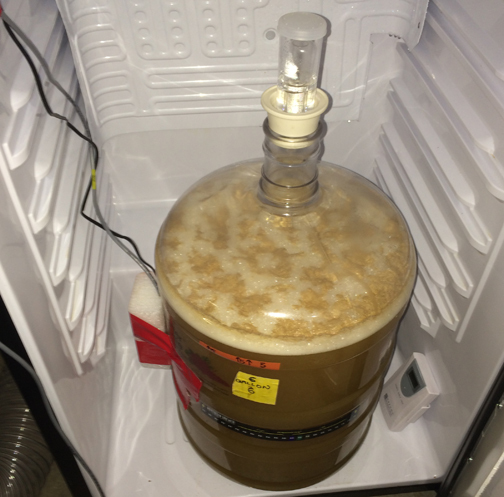 I pitched the Wyeast Kolsch 2565 smack pac yeast. Then I moved it to my temperature controlled fermentation chamber at 15 degrees C. About 59 degrees F. I am told this strain tends to remain suspended and might need some gelatin for final clarification. Great photo history of your brew day. really nice work. I look forward to more of your posts on the Biabrewer forum.